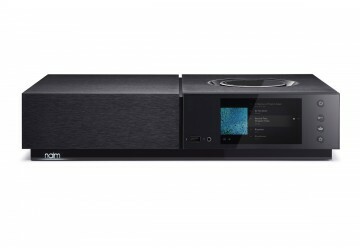 Naim Audio's 'Uniti Star' all-in-one network hifi system combines the functionality and sonic superiority of its siblings, the Uniti Atom and Uniti Core, to form an intuitive and flexible single box streaming/CD playing ripping audio system. Utilising Naim's prolific and renowned knowledge of quality amplification design, superior CD player (and ripper) construction and ability to simplify and portray complicated streaming methods in an easy-to-understand and quality retaining system - the Uniti Star is a serious step-up from its predecessors. The amplification stage of the Uniti Star borrows class A/B technology from the company's critically acclaimed NAIT 5Si amplifier from their range of hifi separates, driven by a large power supply and implemented with SMD technology. This guarantees a well-timed and highly rhythmic music performance, regardless of wireless or hard-wired source. All digital sources are decoded by the Star's powerful and extremely accurate 40-bit SHARC DSP processor (fourth generation). This processor is managed by a unique Naim software to reduce potential jitter to an absolute minimum as well as up-sample lesser quality formats and files that may be running through the system. This superior digital brain lends itself not only to playing CDs and WiFi/Bluetooth aptX streamed music, but also opens the opportunity to retrieve the precious content of your CD collection without compromise. Instead of using the noisy and inferior CD ripping system on your PC or laptop - rip directly from the Star's CD mechanism and DAC technology and save the lossless files to a USB-connected hard-drive or SD card for playback on the network. Please note that if you're viewing this product on a computer, the App Store links will not work as they are only intended to work on mobile devices. The Star can be controlled via Naim's app. Once loaded, there will be a 'Rooms' page, find the Star and you are then ready to browse. The app will come with Tidal (high res streaming app), giving you the ability to search for any song you desire. If streaming songs aren't your personal preference, you can browse over hundreds of internet radio stations or if you've already got a Spotify account, you can use Spotify Connect to the Star and listen to all your songs from any playlist. Who is Naim and what is their Uniti Series? Naim Audio has a special place in British audio, thanks to its founder and inspirational leader Julian Vereker, a hugely talented mechanical and electronic engineer with a passion for, amongst many things, music. Founded in 1973, Naim has always had a firm philosophy of music first, measurements second - each Naim product is extensively auditioned as part of the product development process to make sure that it delivers clear, emotional music-making ability. Naim products are designed to bring the closest facsimile of a live music event into your home listening environment, to give you maximum pleasure from your music collection. 'Uniti' is the term given to Naim's series of all-in-one network players, designed and engineered to offer a flexible and versatile operation while retaining the best possible sound performance without compromise - something Naim has become renowned for over many years as a critically acclaimed home audio/hifi manufacturer. The Uniti series also allows for multiroom audio, allowing you to link one or more players together in order to fill your home with flawless sound from a wide range of sources.